Since Genting Singapore (GENS) reported 4Q17 EBITDA fell 20% q-o-q, GENS share price has tumbled 14%. Adjusting for normal VIP win rate and non-recurring items, 4Q17 EBITDA would have been 11% higher and a comfortable 24% of our FY18 forecast. In our view, all signals point to the VIP and mass markets improving going forward and GENS’ current share price is unjustified as it implies ‘crisis’ valuations. Our unchanged SGD1.46 Target Price is based on 12x FY18 EV/EBITDA, in-line with the 9-year 12M forward EV/EBITDA mean. 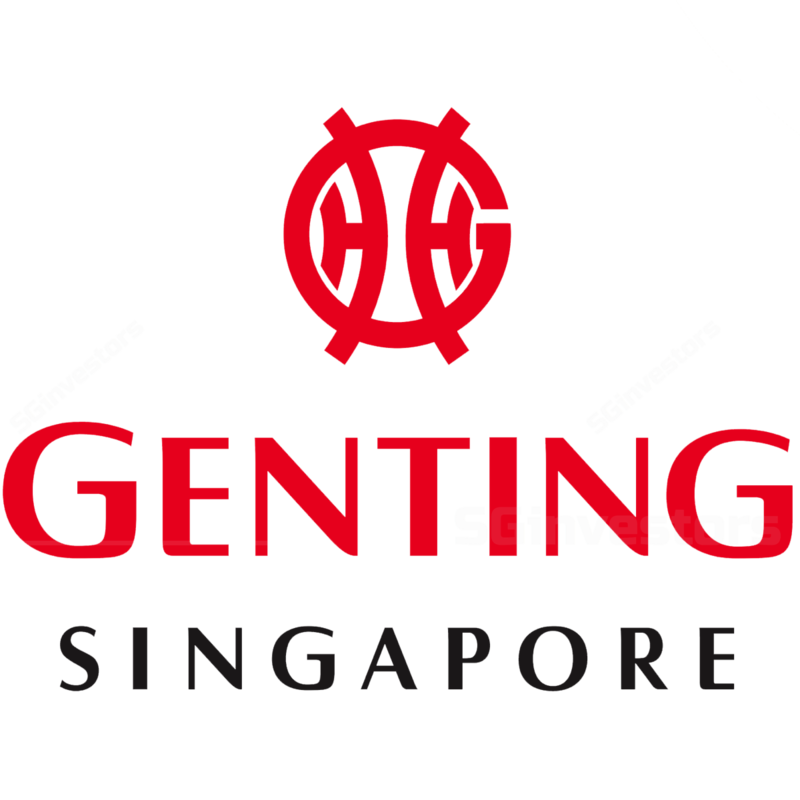 Since Genting Singapore (GENS) reported 4Q17 EBITDA of SGD255.1m, down 20% q-o-q, its share price has tumbled 14%. In this segment, we normalise its VIP win rates for the theoretical average of 2.85% and adjust for any non-recurring items to arrive at VIP win rate normalised EBITDAs to more accurately gauge GENS’ earnings quality. Note that 1Q17-3Q17 EBITDA were positively impacted by higher-than-average VIP win rates of 3.0%-3.1%. Adjusting for normal VIP win rates, we estimate 1Q17-3Q17 EBITDA would have been lower. Conversely, 4Q17 EBITDA was negatively impacted by a lower-than-average VIP win rate of 2.7% coupled with provisions for staff bonuses, more events (Halloween Horror Nights, Flying Through Time, Christmas parties) and inventory write-offs of ~SGD20m (incurred when renovating gaming areas into Melati Club, Maxims Premium Slots and other premium mass gaming areas). Adjusting for normal VIP win rate and the aforementioned non-recurring items, we estimate 4Q17 EBITDA would have been 11% higher at SGD285m or a comfortable 24% of our FY18 forecast. 4Q17 normalised EBITDA would be -7% q-o-q, lower than the headline -20% q-o-q. The one negative observation we can make is 4Q17 direct VIP rebate rate as a percentage of VIP volume inched up ~25bps to 1.7%. That said, GENS stated it did not actually raise its direct VIP rebate rates per se, which has been unchanged since May 2017. It welcomed more high-end VIPs whose direct VIP rebate rates commence at higher levels as compared to low to mid-end VIPs. As GENS seeks to widen its VIP base to include more low to mid-end VIPs, it does not expect a structural increase in its direct VIP rebate rates. At first glance, GENS’ record low trade receivables balance of SGD126.9m as at end-4Q17 indicates GENS has tightened its credit extension policy. But we understand this is not the case. Rather, its VIPs are repaying their debts quicker, which results in a low trade receivable balance. Measuring RWS VIP volume velocity (RWS VIP volume/average RWS trade receivables balance), which measures how much VIP volume is generated from every SGD of credit extended, we note it has hit a record high of 56x. It then follows RWS can generate more VIP volume by loosening its credit-extension policy further. Detractors point out that industry VIP volume (Marina Bay Sands and Resorts World Sentosa) eased 2% y-o-y in 4Q17 after growing 14% y-o-y in 2Q17 and 29% y-o-y in 3Q17. By extension, they conclude that the scope for potential earnings upgrades for GENS may be narrowing. That said, note that 4Q17 RWS VIP volume grew ~10% y-o-y to SGD7.5b. Instead, the decline in 4Q17 industry VIP volume was due to Marina Bay Sands (-8% y-o-y). Therefore, we are not overly concerned and posit two possible reasons for 4Q17 industry VIP volume easing 2% y-o-y. High Marina Bay Sands (MBS) VIP win rate – VIP volume and win rate are inversely correlated (Fig 6). VIP volume is the product of buy-in and number of times the buy-in is rolled. If VIP win rate is high (casino wins more and VIPs lose more), the number of times VIPs roll their buy-ins will fall resulting in lower VIP volume. This is what we gather happened to MBS in 4Q17 as its VIP win rate then of 3.95% was the second highest in its history (Fig 7). As MBS VIP win rate normalises to lower levels, we expect MBS and industry VIP volume growth to revert to higher levels going forward. Naga 2 opening – Our conversations with NagaCorp (3918 HK, Not Rated) and junkets reveal that the opening of Naga 2 in Phnom Penh, Cambodia in Nov 2017 temporarily diverted a lot of South East Asian VIPs to there, especially those from Malaysia and Singapore. That said, we understand that the initial ‘euphoria’ subsided in 1Q18 and the aforementioned South East Asian VIPs have returned to gambling in Malaysia and Singapore. Again, we expect industry VIP volume growth to revert to higher levels going forward. We believe the Macau VIP market recovery will continue to spill over to the Singaporean one. Our conversations with industry participants reveal that the return of Chinese VIPs to Macau (2M18 Macau VIP GGR: +21% y-o-y), thanks to improving macro-economic fundamentals in China, has and will spill over to other Asian casinos (Singaporean ones included). In the words of an industry participant that we spoke to, “Macau is the source market of Chinese VIPs. All Chinese VIPs that gamble in Australia, Singapore and the Philippines today all started out in Macau. When the Macau VIP market recovers, we benefit as well”. FY18 VIP volume share of 40% or up 3ppts y-o-y (4Q17: 41%). To be fair, we forecast FY18 VIP GGR to grow by a slightly narrower 12% y-o-y as we assume FY18 VIP win rate of 2.85% or 8bps lower y-o-y. On the higher margin mass market (MM), we expect it to continue to stabilise. Consumer sentiment in Singapore, as exhibited by retail sales, has been recovering and this has translated into industry MM GGR ceasing to contract y-o-y since 2Q17. As Singapore’s GDP (FY18E: +3.1%, FY17: +3.6%) continues to grow, we expect industry MM GGR to continue to stabilise. FY18 mass market GGR share of 40% or up 1ppt y-o-y (4Q17: 40%) before growing 5ppts p.a. in FY19 and FY20. We do not discount the possibility that RWS may regain more MM GGR share than expected. Our research indicates a strong correlation between RWS MM GGR share and the MYR/SGD exchange rate. We understand that this is because RWS has more Malaysian gamblers than MBS due to its Genting heritage. As the MYR/SGD exchange rate has been recovering (MYR0.34/SGD1.00 currently), RWS may continue to regain MM GGR share in the near future. Our sensitivity analysis indicates that every 1ppt gain in RWS MM GGR share will accrete 4% to our EPS estimates. upgraded and renovated its other premium mass gaming areas in 4Q17. Our earnings estimates are little changed (FY18: -0%, FY19: -0%, FY20: +0%) as we have maintained our major assumptions. Similarly, our EV/EBITDA-based Target Price of SGD1.46 premised on an unchanged 12x FY18 EV/EBITDA (9-year 12M forward EV/EBITDA mean: 12x) is also virtually unchanged. With a whopping 28% upside potential, maintain BUY on GENS. We continue to like GENS for its earnings quality, deep value and potential to secure a Japanese casino licence in FY19. 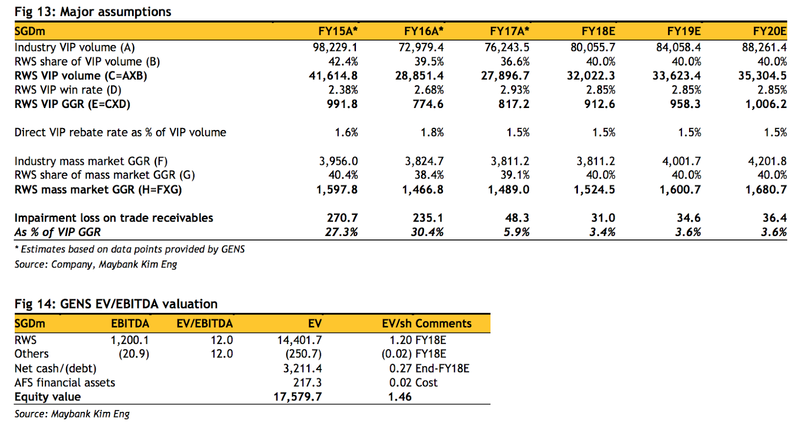 GENS is trading at 9x FY18 EV/EBITDA or -1 SD to the 12M forward EV/EBITDA mean, which we opine is unjustified. The last time GENS traded at such cheap valuations was from mid-FY15 to mid-FY17 when GENS reported net losses due to derivative losses coupled with large foreign exchange losses and impairments of trade receivables. As GENS no longer suffers derivative losses and its foreign exchange losses and impairments of trade receivables of late have been negligible (4Q17 impairment of trade receivables of SGD4.7m was a record low), we opine that GENS should trade at least in line with its mean valuations. GENS is trading at 12M forward EV/EBITDA of 9x, which is well below 15x for the Macau casino operators average. This discount is 6x EV/EBITDA multiples (40%), which is close to the all-time widest discount of 8x.